Corrosion of steel, aluminum, and other structural metals erodes the safety and financial stability of industries and countries alike. Fighting corrosion in ships, tanks, planes, and equipment, for example, costs the Pentagon $22.9 billion a year. Corrosion costs advanced industrialized nations about 3.5 percent of GDP to replace damaged material and components, plus a similar amount due to lost production, environmental impact, disrupted transportation, injuries, and fatalities. While traditional corrosion protection has relied mostly on short-lived, physically-bonded coverings of substrate surfaces, a new category of chemically bonded phosphate ceramics (CBPCs) can create a long-lived passivation layer that stops corrosion. This is further protected by a tough ceramic outer layer. For generations, polymer paints have acted as a physical barrier to keep corrosion promoters such as salt water and oxygen away from steel and aluminum substrates. This works until the paint is scratched, chipped, or breached and corrosion promoters can enter the gap between the substrate and polymer coating. Then the coating can act like a greenhouse, trapping water, oxygen, and other corrosion promoters, which allows corrosion to spread. Placing sacrificial, reactive elements next to steel that will corrode first, such as zinc and galvanized coatings, is another strategy. This works until the sacrificial elements are used up, and recoating becomes necessary, usually after a few years. Cathodic protection, where a negative voltage is imposed on steel, can limit corrosion on pipelines or other stationary, continuous metal structures where voltage can be attached. But this can fail if it’s not properly insulated and voltage goes to ground. For assets that demand long-term corrosion protection, stainless steel alloys work. But with stainless steel costing up to six times more than mild steel, this option is often cost prohibitive. Ideally, engineers, facility managers, and industrial paint contractors want the long-term corrosion-resistance of a stainless steel part with the lower cost of coating application. A new category of CBPCs such as EonCoatis now making this best-of-both-worlds desire possible. “Unlike polymer paints that simply cover a substrate, CBPCs essentially ‘alloy’ the surface,” said Tony Collins, CEO of EonCoat. Scanning electron microscopy indicates this passivation layer is about 20 microns thick. X-ray diffraction indicates this passivation layer is about 60 percent iron with components of phosphate, magnesium, silicon, hydrogen, and oxygen. Slight oxidation on the surface allows for the best chemical reaction. The chemical reaction creates an alloyed metal surface rather than a layer that sits on top of the substrate and this makes it virtually impossible for corrosion promoters like oxygen and humidity to get behind the coating the way they can with ordinary paints. Prime coats are eliminated on most substrates, as well as the need for multiple topcoats on all substrates. The corrosion-resistant passivation layer is further protected by a ceramic outer shell. This dense ceramic outer shell is impermeable to water, and resists impact, abrasion, chemicals, and fire. 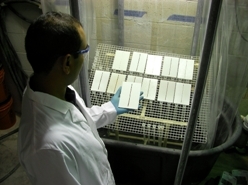 The ceramic outer shell forms simultaneously with the passivation layer and chemically bonds with it after acid and base materials mix in the spray gun nozzle then react with the substrate surface. The dual-layer ceramic coating can be used both as a primer and a topcoat, and it can be applied in a single pass that’s dry to the touch in a minute, reaches a hard dry in 15 minutes, and can be returned to service in an hour. Though CBPCs such as EonCoat have proven themselves in the laboratory and in examples such as the Iron Pillar, Tony Collins knew that the effectiveness of the new material had to be compared to that of traditional anti-corrosion coatings. Duplicating a NASA corrosion test, Collins put EonCoat to the test against 19 leading anti-corrosion coatings in a live corrosion test, broadcast by webcam. Coated samples were scribed, then exposed to 12 hours of sea spray, followed by 12 hours of sunlight (or the UV light equivalent). After 45 days, every other high-performance coating tested failed. Except for the rust on its scribe (gouge) line, the EonCoat sample looked the same as day one. In the latest test of the coating, which has passed 120 days and includes brand names matched to numbers, 20 Q panels coated with a popular primer, topcoat, or EonCoat are sprayed daily with corrosive seawater.